The Question is, Who Listens? No, that is not your conscience speaking to you, that is the Holy Spirit. The devil is an expert at twisting the truth into a lie so if you depend upon your “conscience” you are easy prey for Him. Then how will you know if it is the Holy Spirit or the devil? The answer is in developing a deep personal relationship with Jehovah by reading your Bible and obeying what it says. From my personal experience when I am reading the Bible and a verse jumps out at me, that is the Holy Spirit speaking to me. I stop reading and pray for enlightenment. Then he guide me to understanding the Bible verse in context to what He is saying about my life. Another way is to listen to good sermon like on sermonaudio and reading good Christian books like can be found on sites like goodread and https://www.gutenberg.org (personally my preference is for the old classics). Of course we should also have godly Christian councilors. The problem I have sadly witnessed too frequently is that even when others know Jehovah is speaking to them the deliberately chose to ignore Him because he is telling them something they do not want to hear. They want their way, not Jehovahs. That is a sure recipe for disaster. Then when catastrophes occur they go cry babying to Jehovah and ask why He is doing this to them. Are you experiencing difficulties in your life right now? Are you listening to Jehovah as He is speaking to you? 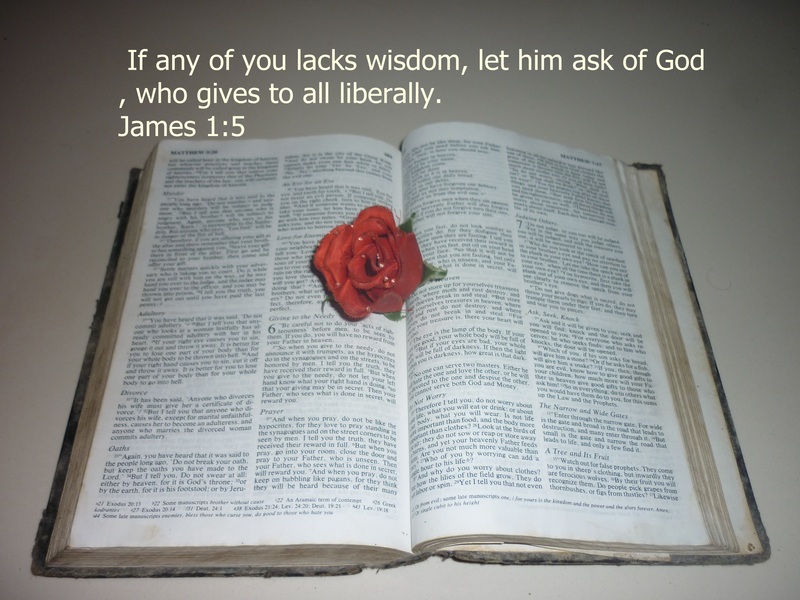 Prayer: Thank you Jehovah Rabbi (God our Teacher) for blessing me with patiently teaching me to be wise, gracious, humble and meek like my Beloved King Jesus. Thank you for the tools You have blessed me with to receive an ever deepening of these blessings. I exalt You in the name of the wisest Rabbi of all Jesus Christ. Amen. Categories: arrogance, Bible verses, blessing, Christ’s love, Christian, Christian commitment, Christian community, Christian conduct, Christian culture, Christian devotional, Christian duty, Christian family, Christian life, Christian love, Christian mediation, Christian Meditation, Christian photography, Christian prayer, Christian quotes, Christian society, Christianity, consequences, conversation, devotion, discernment, discipleship, discipline, discussions, disobedience, divine guidance, divine help, experience, faithfulness, fools, God, Godliness, Gods grace, Gods will, guidance, habits, Holy Bible, Holy Spirit, Jehovah, Jesus, knowledge, learning, lifestyle, loving relationship, narcissist, obedient, obey, people, personal experience, prayer, Prayer of Gratitude, prayer of love, praying, pride, Psalm, relationships, respect, Righteousness, scripture, self centered, society, spiritual blessings, spiritual nurishment, stubborness, submission, teaching, Word of God | Tags: arrogance, Bible verses, blessing, Christ’s love, Christian, Christian commitment, Christian community, Christian conduct, Christian culture, Christian devotional, Christian duty, Christian family, Christian life, Christian love, Christian mediation, Christian Meditation, Christian photography, Christian prayer, Christian quotes, Christian society, Christianity, consequences, conversation, Devotion, discernment, discipleship, discipline, discussions, disobedience, divine guidance, divine help, experience, faithfulness, fools, God, God’s grace, Godliness, Gods will, guidance, habits, Holy Bible, Holy Spirit, Jehovah, Jesus, knowledge, learning, lifestyle, loving relationship, narcissist, obedient, obey, people, personal experience, prayer, Prayer of Gratitude, prayer of love, praying, pride, Psalm, relationships, respect, righteousness, scripture, self centered, society, spiritual blessings, spiritual nurishment, stubborness, submission, teaching, Word of God | Permalink. That I May Not Cause Pain! Think of a loving father that guides his child in how to have mature respectful relationships. That is a good father. How much more supreme is Jehovah our Heavenly Father? When we submit to His divine wisdom He guides our thoughts away from evil and towards love and good. When someone does us wrong our first instinct is revenge. This is a never ending circle of destruction of I get you back, then you get me back even worse. Each time it escalates. When, instead we pray to our loving Father to take our hand and guide us in the righteous way to handle the matter not only does it prevent a lot of hardship and trouble but it also glorifies Him. Then there is the unknown. Perhaps someone did us wrong unintentionally but we take it personally and want revenge. An innocent individual gets hurt. As well, we as ambassadors of Christ blacken His holy name. This has happened to me on a few occasions and I felt like a fool towards the one I offended and all those present. As well I was deeply ashamed towards my loving Father in Heaven. When the truth came to light I humbly approached them and deeply, sincerely apologized. If we pray for Jehovahs hand to guide us through the situation and are obedient unto His guidance we not only prevent unnecessary harm but bring glory unto Him. Because of this we may be the catalyst to brining lost souls into Jehovahs holy family by our actions. Prayer: Please Jehovah-‘Immeku (The Lord Is With You) daily take my hand and guide me words and actions that they bring praise and glory unto You and bring the little lost sheep unto You. I humbly request this in the name of he who led His disciples into becoming wise, meek, humble and gracious unto all Jesus Christ. Amen. Categories: Christian behaviour, Christian conduct, Christian duty, Christian education, Christian photography, Christian quotes, Christianity, commitment, compassion, conduct, culture, destructive habits, discipleship, divine guidance, education, family, famous quotes, friends, Gods grace, gracious, guidance, habits, hate, healing, Holy Bible, Holy Spirit, honour, hospitality, humble, injustice, Jesus, judgment, justice, Kindness, knowledge, learning, life, lifestyle, love, loving relationship, marriage, mental health, mentoring, mercy, obedience, obedient, opportunity, Peace, people, polite, prayer for wisdom, psychology, Quarrels, quotes, reconciliation, relationships, repair, repent, respect, restoration, service, society, suffering, teaching, tragedy, Wisdom | Tags: Christian behaviour, Christian conduct, Christian duty, Christian education, Christian photography, Christian quotes, Christianity, commitment, compassion, conduct, culture, destructive habits, discipleship, divine guidance, education, family, famous quotes, friends, God’s grace, gracious, guidance, habits, Hate, healing, Holy Bible, Holy Spirit, honour, hospitality, humble, injustice, Jesus, judgment, justice, kindness, knowledge, learning, life, lifestyle, love, loving relationship, marriage, mental health, mentoring, Mercy, obedience, obedient, opportunity, peace, people, polite, prayer for wisdom, psychology, Quarrels, quotes, reconciliation, relationships, repair, repent, respect, restoration, service, society, suffering, teaching, tragedy, wisdom | Permalink. He Will Give It To You. When you are facing difficulties, no matter if it is loss of employment, relationship problems, health problems or living arrangement problems give it completely to Jesus in faith and He will see you through it. It does not mean he will remove your problems. It means he will give you the strength and wisdom to get through it. When reflecting on how Jesus blessed you with wisdom and strength you will love Him, respect Him and worship Him even more. Another thing is that through the crisis you learn to draw closer to Him in a loving relationship. It constantly amazes me the way Jesus works through me problems without me ever realizing it until after the problem has been solved. I am truly amazed by Him and love and adore Him more and more with each passing day. Each of those problems I mentioned I experienced a severe crisis in and each time Jesus guided me through them. Some of them were minor little squalls and some of them were full blown tsunamis. Each time at the other end I was blessed with not only getting through them but a deeper loving relationship with Christ. The offer is available to you as well. Will you take it? Prayer: Thank you Jehovah El Shaddai (God who is sufficient for the needs of His people) for always providing me with the assistance I need in just the right amount I need. I gratefully thank you in the name of He who blessed the people with just the right amount of fish and bread Jesus Christ. Amen. Categories: afflictions, answered prayer, anxiety, Bible, blessings, burden, Christian life, crisis, Psalm, respect, strength, sustain, Wisdom, Worship | Tags: answered prayer, anxiety, Bible, Blessings, burden, Christian life, crisis, Give It, health problems, loving relationship, Psalm, relationship problems, respect, strength, sustain, wisdom, worship | Permalink. The More Amazed I Am. The more I read and understand the Bible the more amazed I am at how reverent it is in my life. For example since learning in the book of Titus to warn a troublemaker twice, if they refuse to listen have nothing to do with them I have a lot less stupid arguments. I come to understand that they are their happiest when causing trouble. When reading about Joshua and how he endured forty years in the desert because of the disobedient Israelites he ended up enjoying the gifts of a fruitful life in the promised land. Whenever I get discouraged and read the Bible the Holy Spirit always leads me to encouraging verses or to situations where people in the Bible endured hardships and prospered. For example I learned that when the disciples were in the storm and called out to Jesus He rescued them. He allowed them to encounter the storm to teach them to depend more upon Him. That is a great lesson for me. Truly, the more I read the Bible the more amazed I am how much I see myself in its pages. Prayer: Thank you Jehovah Chanan (God is gracious) for the amazing blessing of Your incredible book of knowledge, the Bible. Thank you for being so gracious as to open my mind and heart to the wisdom therein and to understand the experiences of those who have gone before me. I give thanks in the name of he who taught so much by quoting and explaining the scriptures Jesus Christ. Amen. Categories: Amaze, argument, Christian life, Christianity, counseling, encouragement, guidance, Holy Bible, knowledge, learning, life, mediation, people, prayer, Rejoice, rescue, respect, scripture, society, spiritual blessings, storms, stress, strife, success, suffering, teaching, testimony, thankful, Trouble, understanding | Tags: Amazed, argument, Christian life, Christianity, counseling, encouraging, guidance, Holy Bible, knowledge, learning, life, mediation, people, prayer, rejoice, rescue, respect, scripture, society, spiritual blessings, storms, stress, strife, success, suffering, teach, testimony, Thankful, Trouble, understand | Permalink. Every day I pray that Jesus molds me to be more like Him. One day I wanted to go to the library to work on my writing. (it is very hot and the library has air-conditioning. As well they are doing construction where I live and it is very noisy). There was a strong feeling to go grocery shopping instead. When at the supermarket there was a one day sale where many of the items needed were half price. While waiting in line an elderly Chinese female tried to queue jump in front of me. I firmly but politely informed her to go to the back of the line as I stretched out my arm to prevent her from jumping in front of me. Chinese are very stubborn and rude so the arm was put out because they just ignore you and do as they want anyway. She tried to ignore me and push in front. I gently but firmly pushed her back and told her in a stronger voice to get to the back of the line. She understood she was not going to get away with her rudeness and the cashier informed her she would not accept her groceries until she got to the back of the line so she angrily went to the back of the line. The other Chinese females were happily impressed. Upon reflecting upon it later I realized that is exactly what Jesus would have done. Please do not be politically correct and say the old female should have been allowed to get away with her arrogant rudeness. Jesus did not accept abhorrent behavior from anyone regardless of age or status and neither should a Christian. Prayer: Thank you Jehovah Rabbi (God our teacher) for blessing me in the proper manner in how to deal with arrogant and rude men and women. I give thanks for this gift in the name of he who did not tolerate rudeness Jesus Christ. Amen. Categories: abuse, arrogance, Bible, blessings, Christian life, Christianity, conduct, consequences, destructive habits, domineering, emotions, encounter, encouragement, endurance, evil, experience, frustration, gentleness, Gifts, gladness, God, Godliness, gracious, grateful, greed, justify, liars, life, manipulate, mannerism, motives, opportunity, oppression, ordeal, patience, people, perseverance, personalities, polite, Prayers Answered, pride, provision, Quarrels, relationships, respect, rude, self centered, shame, sin, society, stubborness, success, suffering, thankful, thief, Time, torment, tragedy, Trouble, trouble makers, wicked, Wisdom | Tags: abuse, arrogance, Bible, Blessings, Christian life, Christianity, conduct, consequences, destructive habits, domineering, emotions, encounter, encouragement, endurance, evil, experience, frustration, gentleness, gifts, gladness, God, Godliness, gracious, grateful, greed, justify, liars, life, manipulate, mannerism, motives, opportunity, oppression, ordeal, patience, people, perseverance, personalities, polite, Prayers Answered, pride, provision, Quarrels, relationships, respect, rude, self centered, shame, sin, society, stubborness, success, suffering, Thankful, thief, time, torment, tragedy, Trouble makers, wicked, wisdom | Permalink.